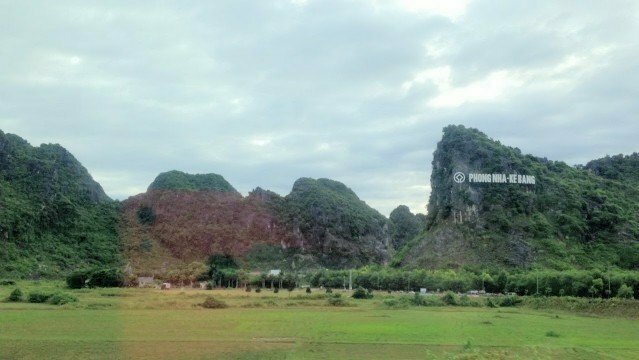 After a 5 hour journey from Hue (on a battered mini bus which we were told would be a comfy sleeper bus, but never mind ) we were welcomed to Phong ﻿Nha by Hollywood inspired mountain lettering. 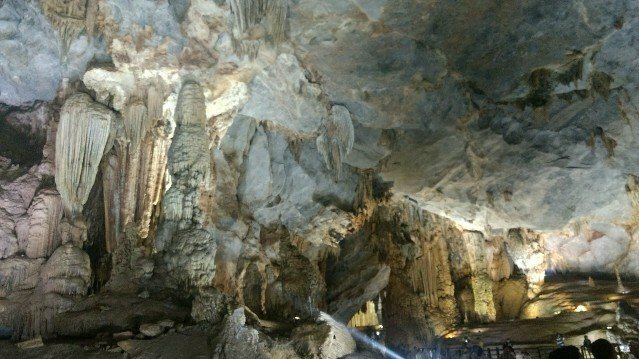 Hang Son Doon – The world’s biggest cave! With the world’s biggest entry fee of $3000! 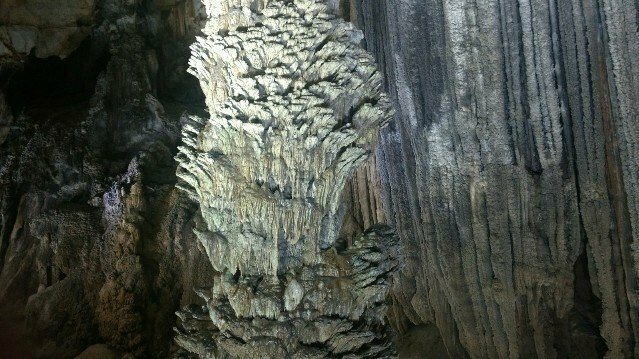 As time, money and the amount of caves you really want to visit in one day is limited, we decided paradise cave was the one for us. So we hired a moped to take us to the sites, this came with a map of a suggested route through the national park which took us through the hills and countryside which made even the journey to our destination pretty decent. 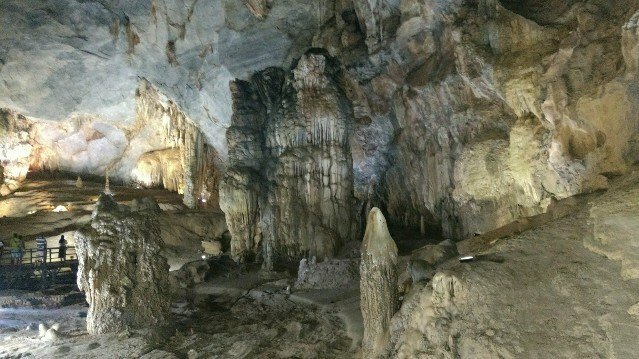 Paradise Cave was only discovered in 2005 by a local farmer, which seems strange but as the small entrance is in the middle of a forest area which had been covered by trees and vines old timers can be forgiven for not noticing. 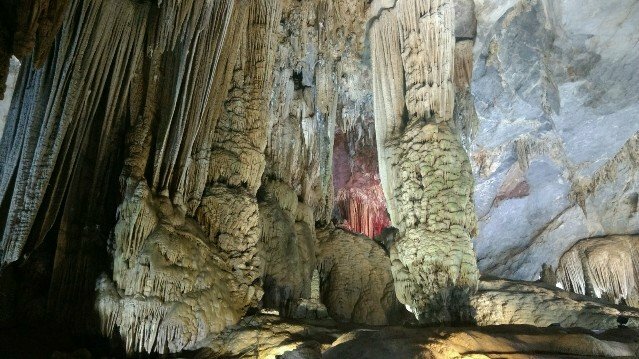 The full length of the cave is a staggering 34KM (although the general public only explore the first kilometer) and it got it’s name because some of the first explorers were so amazed by the rock formations that they thought it looked like paradise. 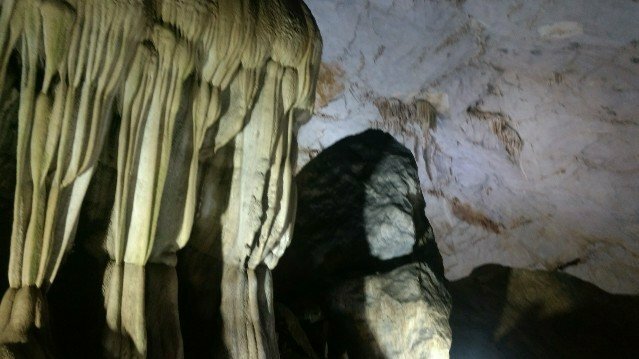 After paying an entry fee of 150,000 VND (about £6) we marched the 350 meter climb uphill to get the caves entrance..maybe another reason why it took so long to find it. Once inside we were not disappointed, the cave was certainly enchanting. 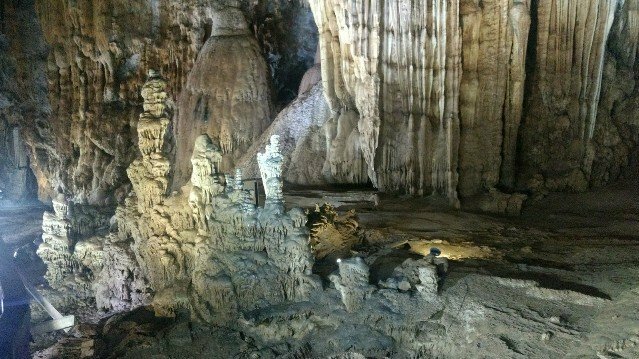 A view dominated by stalagmites, stalactites and limestone. The photos don’t do it any justice! We had pencilled in to visit the Dark Caves too but we were left unsure if they would now disappoint. Luckily we bumped into some girls we’d met in Da Lat who had been and recommended against it. Our choice had been made and it was off to the Botanical Gardens we went. 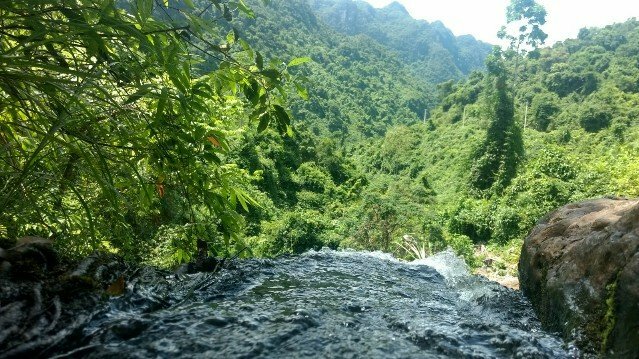 The Botanical Gardens are home to Gio (Wind) Waterfall, Vang Anh Lake, a prototype exhibition house, a propagation section, and pristine forest patches. As we are pretty keen on waterfalls these days, we made that our first stop. 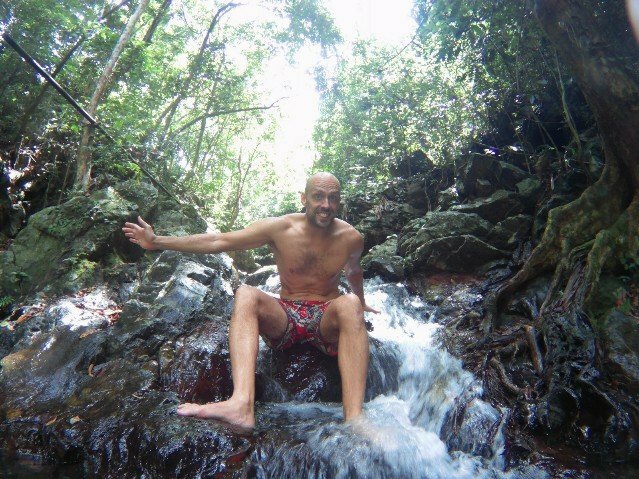 The waterfall was very pretty, and there is a route you can use to climb up and through the waterfall which was enjoyable. 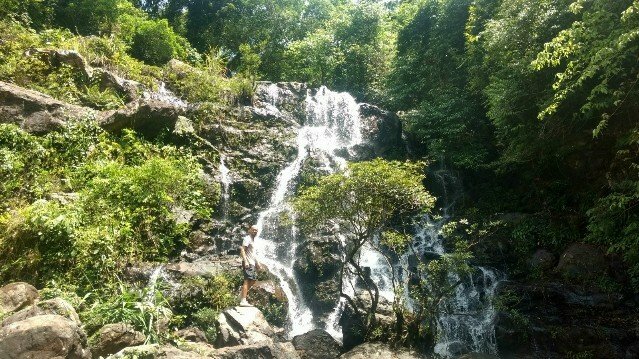 Afterwards we took a very refreshing and much needed swim in Vang Anh lake followed by an easy hike around the rest of the gardens. Aside from the caves, gardens and beautiful landscape we also had a cracking curry at a place called Namaste! A curry that was on a par with any of the best ones we’ve had in England. 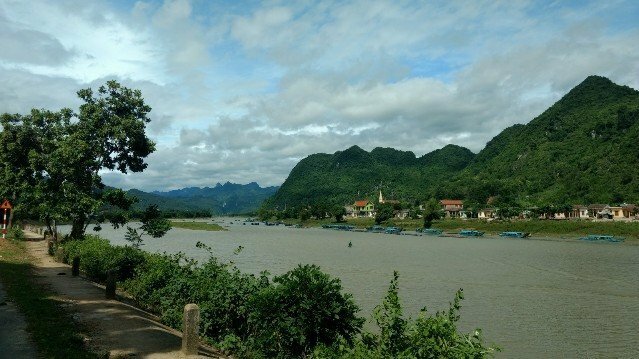 Maybe Phong Nha really was paradise?? Botanical Gardens – Bring your swimsuit. Also insect repellent as the hike was a slight mosquito trap. Hire a moped – If you are comfortable driving I would suggest hiring one as the countryside is lush and the roads are quiet. On top of this they are only around 100,000VND (£3.30) for the whole day so you’ll save a fortune not having to arrange tourist transport. 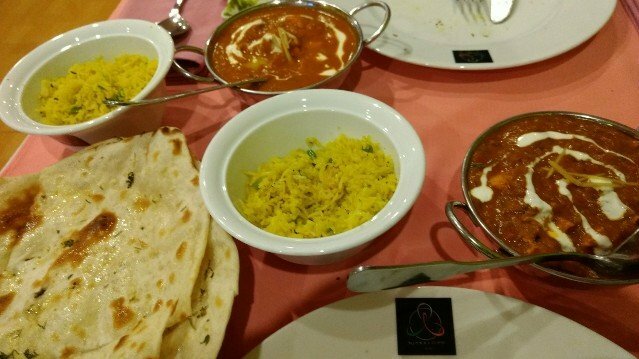 Omar’s Namaste – If you are a curry fan go here! We had the special which was 150,000VND each and each got a starter, popdoms and pickles, nann bread, rice, a chicken main and a beer!